An astonish high grade Walter Johnson Portrait which represents the single finest copy we've brokered in our history. In truth, we've never sold a PSA 7 either. Such a scarce card in high grade with anything over EX condition usually receiving hobby praise. The offered specimen truly lights up a room; pack fresh throughout with four stunning corners and defect free edges throughout. The yellow background is defect free and the focus is spot on. Everything is where is should be in upholding the grade. 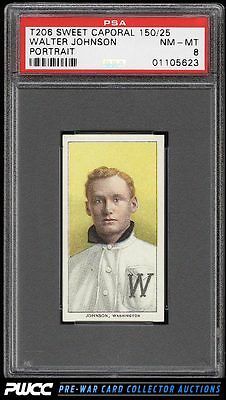 Part of an impressive run of ever popular T206 White Borders on the auction block. In total well over 500 examples are displayed, which represents the majority of an entire set. One of nearly 20,000 cards, lots, and sets up for bid in our 7th Auction of 2016. Click on the link above to view the other PWCC auction lots.